Back Cover: "Dunny knew from an early age what it meant to be an outsider. Her special abilities earned her many names, like freak and water witch. So she vowed to keep her powers a secret. But now her talents may be the only hope of two missing children. A young boy and girl have vanished, feared lost in the mysterious bayous of Louisiana. But they didn't just disappear; they were taken. And amid the ghosts and spirits of the swamp, there is a danger worse than any other, one with very special plans for the children--and for anyone who dares to interfere." I have to say "Water Witch" captured me from the moment I started reading it. It is told from the first person perspective of Dunny. However, the rest of the character's thoughts are in 3rd person point of view including the demented kidnapper, the children and Poochie who is her brother in law's grandmother. Olm's father has died and Olm tries to recreate an ancient pawnee indian ceremony to get the attention of the spirits and obtain power and knowledge. Taking the old stories his grandfather had told him which included annual sacrifices, Olm adapted the ritual to suit his needs. Remember the old adage "close enough for government work." Well, during the ritual Olm manages to release all kinds of malevolent spirits and the only way he could think to get rid of them is more rituals and sacrifices. He starts out with small animals and it escalates to people. Dunny's sister Angelle calls her in a panic, asking her to come to Louisiana. She wants her to use her "special powers" to help find the children. Once Dunny gets to her sister's house, she discovers weird stuff is going on. Angelle lives in a backwater town on the bayou with a cast of real characters. Everyone has their secrets. Trying to keep her "special ability" (no, I'm not going to say what it is) a secret, Dunny and Angelle, along with the help of Angelle's supposedly senile grandmother in law Poochie, who has more upstairs than anyone realizes, set out to try and find the children. Poochie provides a humorous element to the story which interspersed with the gruesome thoughts and actions of Olm, the terror of the two kids, the tension of the two sisters, and the supernatural elements makes for an excellent story. Excerpt: Poochie pursed her lips again, then added for good measure, 'and if you got a little extra time, could you let me know what de hell's goin on wit' de shoes on de purgatory side of my prayer tree? Dem shoes up and disappeared just like dem chil'ren, and it's makin' me cuckoo tryin' to figure out how come. So, if you would give me de answer to dat, too, I'd appreciate it. Now I'm done. Thank you." Three long, dark gray shapes, floating only inches from the gorund, coming from the bayoe toward the house. Although the forms weren't clearly defined, she could make out heads, arms, and what looked like very skiiny stick-shaped legs. By the time she got to her feet, they'd already reached the house and were making their way inside by seeping through the bricks. A huge thank you to Anna of FSB Associates for providing me with a copy of Water Witch. I hadn't read anything by Deborah LeBlanc before and have to say she's earned a new fan. It was interesting to discover Leblanc is, among other things, a licensed death scene investigator, part of a paranormal investigative team, and President of the Horror Writer's Association. She also created the LeBlanc Literacy Challenge in 2004 to encourage people to read and founded Literacy Inc., to fight illiteracy in America. Interesting woman. "In a LeBlanc novel, you can always expect lots of action, suspense, evil that expands the boundaries of horror and plenty of paranormal elements. “Water Witch” is no different and will keep readers up at night until the eerie conclusion. 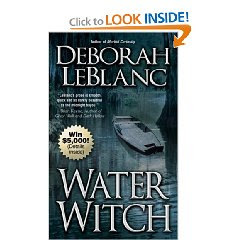 But like LeBlanc’s four previous novels, “Water Witch” contains various storytelling elements and isn’t easily labeled." "Water Witch is the first book I have read by this author. Readers may not realize it but location or background setting does help play a part in telling a story. In the case of this book, the location of Louisiana really set the mood for this story." "Water Witch is a realistic look into madness and what makes us individuals. It’s also a solid and entertaining horror story. The horror was understated and presented in a believable way. I could see all of the scenes clearly in my mind’s eye. I also identified with the characters, even the tortured soul who was the villain."